Watch the trailer for Pan’s Labyrinth and you’ll know you’re getting into something really interesting and original. The film is set in two worlds. The first world is Fascist Spain during World War II (and it’s surprising there haven’t been more movies with this setting, given our morbid fascination with dictators and our unquenchable thirst for WWII-era movies). The second is the fantastic world of fauns and fairies — or is it merely the fertile imagination of a girl who hasn’t quite grown up? It is 1944, and Ofelia and her mother are moving out to the countryside where mother’s new husband is working. He is a stern, unfriendly man, and a captain in the army. His squad is there to capture, kill, or starve the anti-fascist rebels hiding in the mountains. Mother is pregnant with Ofelia’s brother and the Captain’s son. Ofelia is the only child around, but she manages to find entertainment with the fairies, fauns, and other magical creatures who live here. She also makes friends with Mercedes, a servant whose boyfriend is one of the rebels, and a kind doctor who will heal anyone, regardless of their politics. The fantasy world is created with loving detail by director Guillermo Del Toro (Hellboy). That aspect is so important that the special effects credits run at the front of the movie, and the effects house is listed as a co-producer. 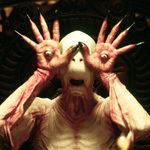 In fact, the fantasy world is probably the primary reason to see Pan’s Labyrinth. The most amazing creature is the full-sized Pan himself (referred to only as “the faun” in the original Spanish), with gigantic curling horns and ungulate legs that bend the “wrong” way. Think Legend blended with The Chronicles of Narnia and you’ll get the idea. There is also a hideous toad that guards a gnarled tree, a Saturnian monster with eyes on its hands, and all sorts of magical creatures and traps. I found myself asking whether the brutality in the Fascist world was really necessary for the film, and I don’t think it was. Then again, Del Toro is a filmmaker with a record of horror and gore, so maybe it’s just his style. In any case, don’t bring your children. The merging of these two worlds seems like a carefully selected metaphor, although I confess it is not immediately clear what it is. There are some interesting and thought-provoking themes, but whether they add up to a something more meaningful is another matter. For example, in both worlds, people are asked to blindly follow orders, whether issued Fascist military commanders or by ancient fairy prophecy. In both cases, free thought proves to be better. If that’s the only parallel, then the metaphor isn’t as grand as it might seem at first glance. Maybe Del Toro simply wanted to make two different movies, and decided to merge them together. Whatever the case, Pan’s Labyrinth works fairly well. Perhaps the combination of worlds is a bit contrived, but it’s not as big a distraction as it might have been. And, as the trailer promises, it’s one of the most interesting and original movies this year. Colin Smart: Having experienced films for 60 years I regard thsi film perfect with perfect ending. It is a combination of the emotional power of Lord of the Rings and the Ken Loach film on the Spanish Civil War. Usually only a handful watch foreign films at my local multiplex but there were only a couple of untaken seats and at the end of film the audience reaction suggested that I am not alone in my praise. Several performances merit Oscar nomination as well as for technical tricks and the musical score. What other 2006 film deserves Best film nomination more?